Introduction: Laparoscopic small bowel anastomoses are completed using the same essential technique as an open anastomosis, but with different instruments. The traditional teaching is to make a transverse closure of the enterotomy. Because the instruments used for laparoscopic procedures are different, the technique needs to be modified to avoid the creation of a stenosis at the edge of the anastomotic ring during closure of the enterotomy. 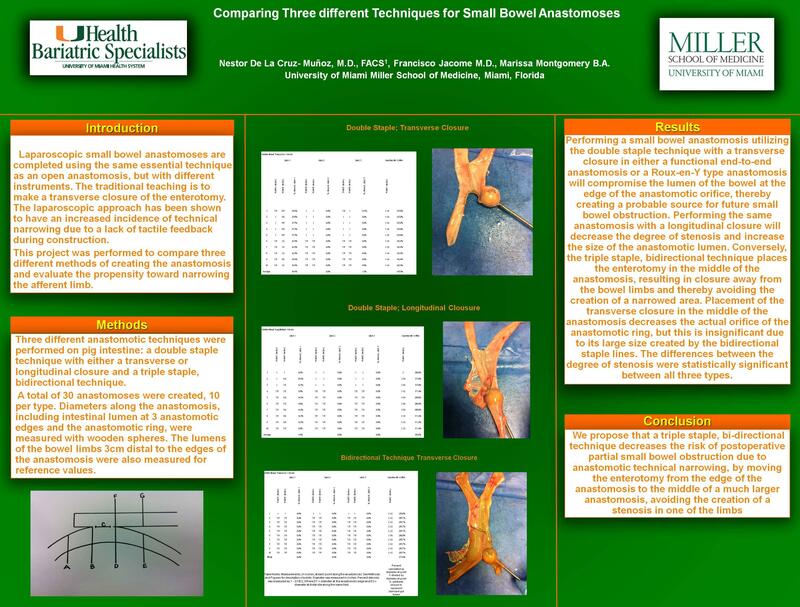 Methods: Three different anastomotic techniques were performed on pig intestine: double staple technique with transverse and longitudinal closures and a triple staple, bidirectional technique. A total of 30 anastomoses were created, 10 per type. Diameters along the anastomosis, including intestinal lumen at 3 anastomotic edges and the anastomotic ring, were measured with wooden spheres. The lumens of the bowel limbs 3cm distal to the edges of the anastomosis were also measured for reference values. Results: Performing a small bowel anastomosis utilizing the double staple technique with a transverse closure in either a functional end-to-end anastomosis or a Roux-en-Y type anastomosis will compromise the lumen of the bowel at the edge of the anastomotic orifice, thereby creating a probable source for future small bowel obstruction. Performing the same anastomosis with a longitudinal closure will decrease the degree of stenosis and increase the size of the anastomotic lumen. Conversely, the triple staple, bi-directional technique places the enterotomy in the middle of the anastomosis, resulting in closure away from the bowel limbs and thereby avoiding the creation of a stenotic area. Placement of the transverse closure in the middle of the anastomosis decreases the actual orifice of the anastomotic ring, but this is insignificant due to its large size created by the bidirectional staple lines. Conclusion: We propose that a triple staple, bi-directional technique avoids the risk of postoperative partial small bowel obstruction due to anastomotic technique, by moving the enterotomy from the edge of the anastomosis to the middle of a much larger anastomosis, avoiding the creation of a stenosis in one of the limbs. Care must be taken to overlap the staple lines when creating the bidirectional anastomosis in order not to create a defect at the junction. We propose making this technique the standard of care for creation of stapled laparoscopic small bowel anastomosis.